ARE YOU GOOD? WITH ITP’S VIZI-MODELER YOU ARE EVEN BETTER! Experience how Process Modeller assists you in BPMN! As flexible, convenient and versatile modeling tool, Vizi Modeler is in any case the best partner in the daily work. We assist you with our know-how developed through years of business process modeling and support you with our technical and professional expertise. With Vizi-BPM-Suite you have in any case a perfect BPMN-Tool on your side to get the output you need. Starting with an easy understandable diagram, creating a report or a documentation or preparing to share via HTML with your team. You need a professional and userfriendly BPMN tool? Enclosed we have summarized typical characteristics for BPMN professions. You work flexible, quick and you work with style. A wealth of indispensable functions supports the creation of handsome process models tailored to your needs. Intuitive Modeling with "Method & Style"
Model with the “Method & Style” approach from Bruce Silver and your models will be understandable to everyone. From all levels of management to IT. methodological and stylistic inspection and guidance according to Bruce Silver guidelines. You can purchase a special license for the “Method & Style” checker automatically through our training partner, ITpearls AG when you visit a “Method & Style” training course. Within a short time (2-5 days, depending on the course level) you can train and certify your BPMN expertise. Included is in-depth coaching from experts. communicate the processes to the business and IT organizations. Vizi Modeler fits like a glove into your IT environment. By integrating with Microsoft Office, you benefit from the many advantages of office standards. Moreover, using Vizi Modeler is super easy. If you are already familiar with Word, Excel and PowerPoint, working with the Vizi Modeler is nothing new. 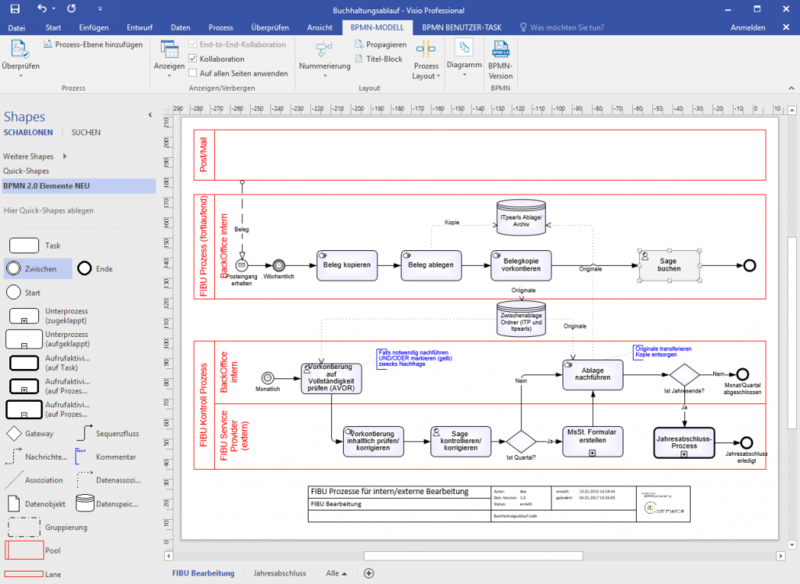 Do you want to link to your organization with the process models in BPMN diagrams? You can do this directly by using previously created organization models. Vizi Modeler integrates your process models directly into the MS-Office software suite. Create process documentation easily using MS Word. BPMN is the standard for business process modeling. With Vizi-Modeler you ar able to create complete BPMN-Models, accurate and understandable for everyone. quality inspection of your models: so your models are correct, not only readable for everyone and but also complete. model exchange: you can import models from BPMN2-XML, edit with Vizi Modeler, and export them again as BPMN2-XML. This allows you to exchange models with other modeling tools as well as run it in a workflow system. beautiful BPMN: you render reader friendly diagrams – whether hierarchical or flat and compact, color or black and white, you choose. Document managment at a professional level – the central administrative unit of the Vizi Modeler. You prefer local Data Managment? Project managers, whether in IT or not, are faced increasingly with the requirement to implement “process-centric” requirements management. These sind business-centered process models and it is in the business where the requirements originate and are specified. Vizi Modeler offers the perfect solution for you. Business processes can be enriched with figures and important information that are essential for the later automation and implementation in the organization. Vizi Modeler allows the storage of any of the attributes on the elements of a BPMN diagram. A powerful reporting feature allows you to create Excel reports from all the stored data. The organizations in which business processes exist are always orthogonal to the process flow. The basic concept and the associated benefits of a BPM strategy can ultimately only be met if business processes are automated. This means that business processes must be carried out in BPM systems. Optimizations and changes in business processes need to be carried out without information loss. This means that BPMN models need to be exported and re-imported. Vizi Modeler provides both functions. Moreover, it is even possible to reconcile models and import external changes selectively. This gives the BPMN modelers a powerful tool with which to exploit the benefits of BPM.